Click here for audio of Episode 2116. Today, gravity versus the incredible lightness of being. The University of Houston's College of Engineering presents this series about the machines that make our civilization run, and the people whose ingenuity created them. I just learned the most surprising thing: The inventor of the hot air balloon also invented the self-acting hydraulic ram, and I can't imagine two more opposite things. Let me explain the hydraulic ram: Suppose we have a water reservoir and want to pump water to a place above it. Water won't flow uphill but it can yield energy when it flows downhill. We could run it downhill through a turbine to generate power for a pump. The hydraulic ram is a poor-man's replacement for an expensive turbine. Water flows downhill through a pipe. As it escapes through a valve in the lower end, it gains enough speed to suddenly trip the valve shut. When that happens, the pressure in the pipe undergoes a very sharp increase. That pops a second valve open, and drives water out through it. The process repeats, rhythmically and automatically, making a loud click-clack sound. It's a wonderfully convenient pump that runs on the potential energy of the water in the reservoir. No motor is needed. That's very far from hot air balloons, but the connecting tissue is made of paper. 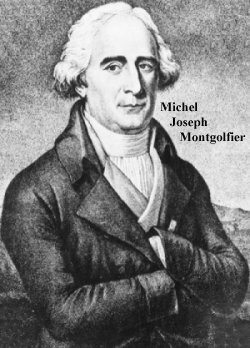 Joseph Montgolfier and his younger brother Étienne were sons of paper manufacturer Pierre Montgolfier. Joseph was a first-rate self-taught mechanic, and he too set up a paper factory. Étienne studied math and architecture. In 1782, the two began experimenting with balloons made of paper and silk. They did a demonstration flight before Louis XVI a year later, and then flew humans in their balloons. Then, as ballooning became Paris's new spectator sport, the brothers withdrew from it. The suave Étienne went back to work with his father. He also tried to develop the theory of ballooning. Shy mechanic Joseph went on to other inventions -- but none so valuable as the hydraulic ram. And he initially created it to serve his paper mill. A British inventor had made a primitive hydraulic ram in 1772, but its valves had to be manipulated by hand. Montgolfier made an immense improvement when he created a pump that could be left to run by itself in, say, land drainage and reclamation projects. That was 1796. A year later, Matthew Boulton, maker of Boulton-Watt steam engines, took out a British patent on Montgolfier's behalf. Many other patents followed and hydraulic rams found wide use during the nineteenth century. Electric motors finally began replacing them. But, as we seek out appropriate technology for developing countries, they're making a comeback. So the brothers Montgolfier were a study in contrasts. Young Étienne, intellectual with strong social instincts -- he even got into politics. And Joseph, the hands-on genius, who straddled two worlds: He very publicly used ephemeral paper and hot air to fulfill an ancient dream. Then he turned about to make use of the corporeal solidity of iron pipe, and water hard as iron, to do our practical bidding -- out of sight and out of mind. For a wonderfully clear 20th-C treatment of the hydraulic ram, written for use in developing countries, see S. B. Watt, A Manual on the Hydraulic Ram for Pumping Water. 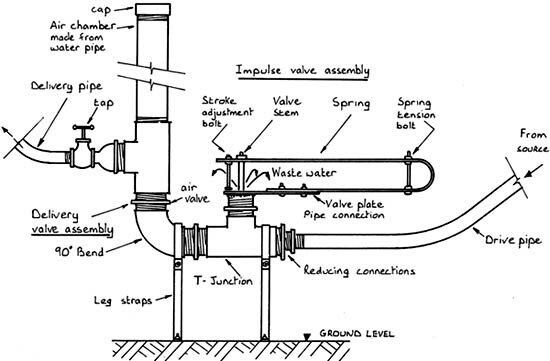 (Silsoe, Bedford, UK: Intermediate Technology Development Group, 1975) I am most grateful to this source for the schematic diagram below. A low-cost hydraulic ram that can be made of common off-the-shelf parts.